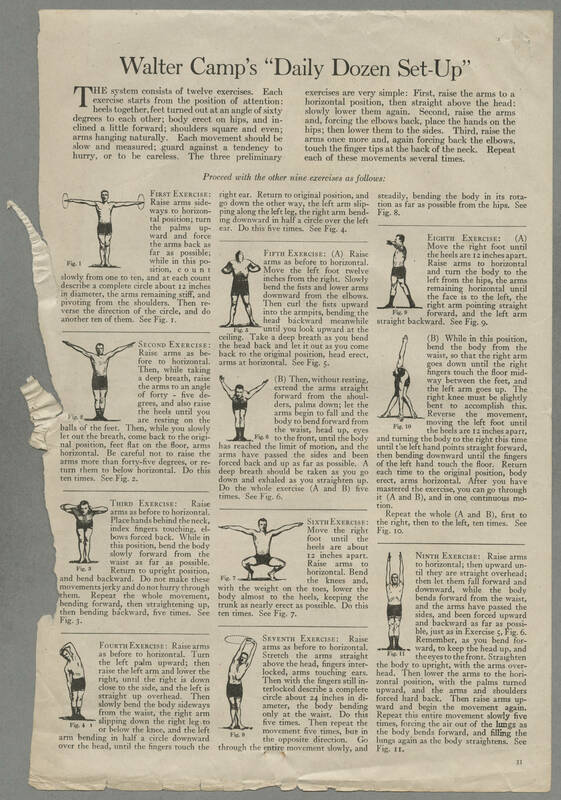 Walter Camp's "Daily Dozen Set-Up" The system consists of twelve exercises. Each exercise starts from the position of attention: heels together, feet turned out out at an angle of sixty degrees to each other; body erect on hips, and inclined a little forward; shoulders square and even; arms hanging naturally. Each movement should be slow and measured; guard against a tendency to hurry, or to be careless. The three preliminary exercises are very simple: First, raise the arms to a horizontal position, then straight above the head: slowly lower them again. Second, raise the arms and, forcing the elbows back, place the hands on the hips; them lower them to the sides. Third, raise the arms once more and, again forcing back the elbows, touch the finger tips at the back of the neck. Repeat each of these movements several times. Proceed with the other nine exercises as follows: First Exercise: Raise arms sideways to horizontal position; turn the palms upward and force the arms back as far as possible; while in this position, count slowly from one to ten, and at each count describe a complete circle about 12 inches in diameter, the arms remaining stiff, and pivoting from the shoulders. Then reverse the direction of the circle, and do another ten of them. See Fig 1. Second Exercise: Raise arms as before to horizontal. Then, while taking a deep breath, raise the arms to an angle of forty-five degrees, and also raise the heels until you are resting on the balls of the feet. Then, while you slowly let out the breath, come back to the original position, feet flat on the floor, arms horizontal. Be careful not to raise the arms more than forty-five degrees, or return them to below horizontal. Do this ten times. See Fig. 2. Third Exercise: Raise arms as before to horizontal. Place hands behind the neck, index fingers touching, elbows forced back. While in this position, bend the body slowly forward from the waist as far as possible. Return to upright position, and bend backward. Do not make these movements jerky and do not hurry through them. Repeat the whole movement, bending forward, then straightening up, then bending backward, five times. See Fig. 3. Fourth Exercise: Raise arms as before to horizontal. Turn the left palm upward; then raise the left arm and lower the right, until the right is down close to the side, and the left is straight up overhead. Then slowly bend the body sideways from the waist, the right arm slipping down the right leg to or below the knee, and the left arm bending in half a circle downward over the head, until the fingers touch the right ear. Return to original position, and go down the other way, the left arm slipping along the left leg, the right arm bending downward in half a circle over the left ear. Do this five times. See Fig. 4. Fifth Exercise: (A) Raise arms as before to horizontal. Move the left foot twelve inches from the right. Slowly bend the fists and lower arms downward from the elbows. Then Curl the fists upward into the armpits, bending the head backward meanwhile until you look upward at the ceiling. Take a deep breath as you bend the head back and let it out as you come back the original position, head erect, arms at horizontal. See Fig. 5. (B) Then, without resting, extend the arms straight forward from the shoulders, palms down; let the arms begin to fall and the body to bend forward from the waist, head up eyes to the front, until the body has reached the limit of motion, and the arms have passed the sides and been forced back and up as far as possible. A deep breath should be taken as you go down and exhaled as you straighten up. Do the whole exercise (A and B) five times. See Fig. 6.